The Bible original Hebrew Reveals as much as 50% more meaning! Institute of Biblical Studies’s affordable online Hebrew language program. The Israel Institute of Biblical studies offers small, weekly online classes where students get personal attention from highly qualified teachers. With their help you’ll find learning Biblical Hebrew step-by-step is simple - and fulfilling. Our small classes fill up quick, so don’t delay. 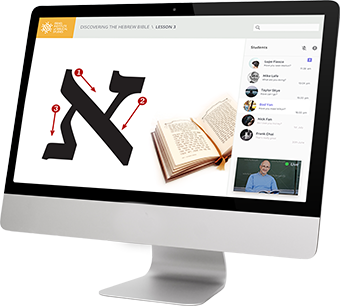 Based in Israel, the Institute of Biblical Studies is the world’s leading online Biblical Hebrew language academy. For over a decade we’ve taught tens of thousands of people from more than 100 countries worldwide. We are affiliated with the Hebrew University of Jerusalem - Israel’s foremost university - and with Israel’s Education and Foreign Affairs Ministries. Dr. Ohad Cohen is a published author, an educator and a professor at the Department of Hebrew Language in the Hebrew University in Jerusalem. He teaches Biblical Hebrew, Biblical Aramaic and Hebrew Phonetics.